There are strict rules regarding photocopying of academic material as defined in the Canadian Copyright Act. Please consult the Fair Dealing page for the requirements for scanned and photocopied materials for academic use. Visit our guide to the public domain for information on finding and using publicly available works. Please consult the Copyright Office if you are uncertain about copyright, fair dealing, or the public domain. Printers and Photocopiers are available at all Dalhousie Libraries. * Archives and Special Collections materials are normally photocopied by staff. When you print something using a Learning Commons computer, your document goes into a print queue. Each Learning Commons computer defaults to a black and white printer, and defaults to double-sided printing. If you want to print single-sided, adjust the printing options before sending your document to the printer. See the chart above for printing costs. Charges will be deducted from your DalCard. Send your document to the printer. Go to the PRINT RELEASE STATION, swipe your DalCard ID or login with your NetID and password, and follow any directions that appear on the screen. NOTE: At the Sexton Library this step is not necessary, as documents automatically print and charges will be deducted from your DalCard. Collect the document from the printer. When you print something using an Express Workstation computer in the library, your document goes into a print queue. Ensure you have enough money on your DalCard ID or Visitor's card to print. Documents that are not printed within an hour will be deleted from the print queue. When the "Login" box appears, enter your NetID and password. If you do not have a netID, use the number posted at the top of the monitor as the username and the password. Go to the PRINT RELEASE STATION, swipe your Dalcard ID or Visitor's card, and follow any directions that appear on the screen. If you are a current Dalhousie student, staff or faculty member, you can use your laptop to print to a printer at a Dalhousie Library. Please log in here and select Web Print from the menu. 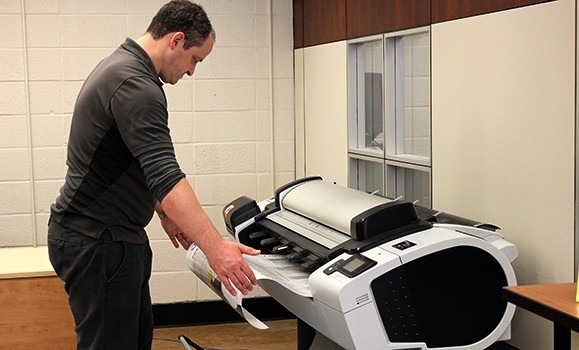 The Killam Help Desk operates a poster printing service. The HP Designjet T2300 large format printer can print maps and posters up to 36 inches wide. Two types of paper are available. Matte paper is priced at $9 per linear foot, satin paper is $10 per linear foot. Files should be in pdf format for printing. If you have multiple pdfs they can be merged into a zip file. The printer is in operation from Monday to Friday. Turnaround time should be within 24 hours on business days. More than 5 posters may require more than one business day, dependent on current workload. After successful submission you will receive a confirmation email and ticket number. You will receive a further email when your poster is ready. Payment is made after printing with cash, credit, debit or Dalcard. If paying with departmental funds, please bring this completed form with you. For general poster printing queries email helpdesk@dal.ca. If you have questions about lead time for a high volume of posters, for example if you are responsible for organizing poster print for a conference, please email helpdesk@dal.ca. If we are notified ahead of time we can make arrangements with you to ensure your printing is done on time.